[SatNews] GL Communications' latest product, LightSpeed1000™ with Channelized Emulation and Analysis of T1s and E1s, offers a unique architecture, whereby thousands of T1s and E1s can be accessed directly from within an optical SONET or SDH structure— with ease for emulation and analysis. SONET SDH technology forms the transmission backbone for TDM, IP, and Wireless networks. STM-1 and OC-3 optical transmission rates (155.52 Mbps) are the most common of the various dense pipes (in SDH SONET) carrying E1, T1, E3, T3, and Ethernet multiplexed signals. 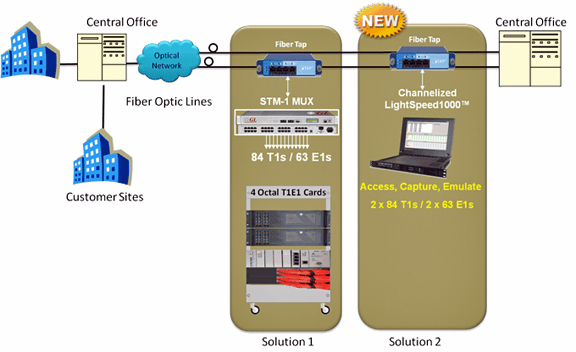 To access and analyze channelized lines within OC-3 STM-1 can require specific and costly mux/demux hardware (perhaps at several layers) and unique test equipment. Direct access to any channel and traffic type within OC-3 STM-1 would negate the need for such additional bulky hardware and greatly simplifies testing, monitoring, and analysis cost effectively. GL's LightSpeed1000™ in Channelized Mode provides such simplicity, permitting direct DS0 level access to hundreds of T1s and E1s, and in the near future all the E3s and T3s constituting the OC-3 and STM-1. This platform with its unique architecture eliminates the requirement for external multiplexing hardware and hundreds of cables and connectors. Multiple, independent streams of any user-defined capacity can be generated internally, analyzed, and monitored in real-time. GL's LightSpeed1000™ supports Channelized SONET and SDH mapping to T1 E1 framing modes. When the LightSpeed1000™ is configured in SDH framing mode, it is capable of supporting bidirectional channelization into 63 independent E1 channels. When configured for SONET framing mode, the LightSpeed1000™ is capable of supporting bidirectional channelization into 84 independent T1 channels. GL's LightSpeed1000™ hardware platform (PCIe Card and USB Pod) is capable of unchannelized or concatenated mode, permitting access to PPP and ATM networks, and wire-speed processing on quad optical ports for functions such as wire-speed recording and wire-speed playback of Unchannelized and Channelized ATM, PoS, and RAW Traffic. Comparison of Channelized OC-3/STM-1 Test Solutions. The image to the right depicts 2 solutions for testing channelized OC-3 STM-1 lines. The first solution shows an external multiplexer and demultiplexer hardware providing the channelized information to multiple T1 E1 access cards such as GL's Octal T1 E1 cards for analysis and emulation. This solution would require multiple PCs, T1 E1 access cards, and numerous cables adding to the cost and complexity of the entire solution. In the second, a more simpler solution is provided by GL's Channelized LightSpeed1000™ board, which supports direct access to all or user-defined 2 x 84 T1s or 2 x 63 E1s per card for analysis and simulation - all within a one pc. With this hardware, any combination of DS0/64 kbps, fractional T1/E1, and N x T1/E1 interface definitions (a total of 126 E1s or 168 T1s - each port supporting 84 T1s or 63 E1s) can be accessed for performance monitoring. For comprehensive information on the application, please refer to LightSpeed1000™ with Channelized Emulation and Analysis web page located at this direct link.